Hey lovelies...I hope you've all had a great weekend the weather has turned a little nippy down here in Devon so I've been treating myself to a nice pampering. As some of you may remember I do suffer from a dry scalp every so often and have tried numerous treatments to try and help restore my scalps natural oils. Thankfully I think I've finally found the product which helps hydrate the scalp but also works wonder on your hair and the ends. 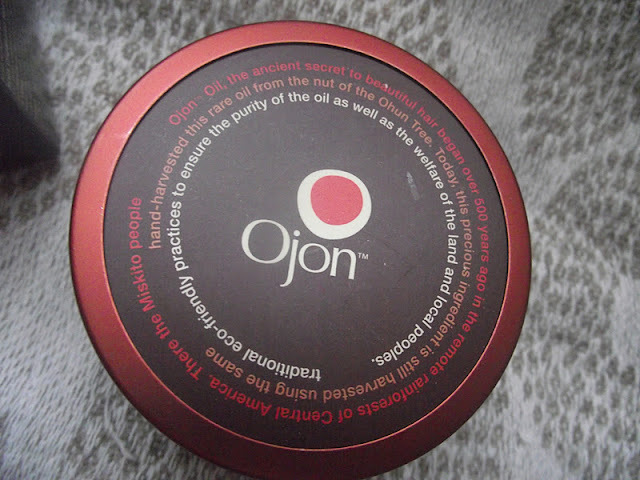 Have you heard of Ojons Restorative hair Treatment? The scent is a concoction of coffee beans and dark chocolate which I don't mind but not be to everyones liking but once the treatment is applied to the hair the scent does settle down. Their are clear instructions on the jar and then it's basically down to you how you wish to use the product. I've been using this the evening before the day I am due to wash my hair, that way I'm giving my ends an intensive treatment over night. I normally scoop about a teaspoon into my palm and the product literally melts into an oil which you then apply to your hair/scalp. It's always best to use a wide toothed comb and comb through the hair to ensure even coverage. It's prob best you place an old towel over your pillow case just case. The product has a plastic protective seal which is nice, it lets you know the product has been tested and is nice and fresh. Once you've discarded the plastic film their is a rubber seal which you can use in place to keep the product clean and fresh in between treatments. 64% improvement in the condition of dry, damaged hair after just 1 treatment*. This clinically proven cult classic is fortified with nature's powerful golden elixir, a rare powerful natural ingredient that's rich in essential lipids similar to those found in healthy hair. After just one treatment, this rich, velvety balm dramatically helps restore vibrant health and high-gloss shine to even the most damaged hair. Hair is soft, silky and manageable. Formulated without Preservatives, Water, Artificial Color and Silicones*In a dry combing study using shampoo and damage reverse™ Restorative Hair Treatment, when left on overnight. This is a little on the pricey side but will last you for months and months as you only need a small amount, you fancy treating yourself or if you want to hint to someone maybe Santa? Then you can purchase Restorative Hair Treatment at John Lewis online and also in selected John Lewis's department stores. Have you tried this wonder treatment?